Nowadays, cancer therapy remains limited by the conventional one-size-fits-all approach. In this context, treatment decisions are based on the clinical stage of disease but fail to ascertain the individual ´s underlying biology and its role in driving malignancy. The identification of better therapies for cancer treatment is thus limited by the lack of sufficient data regarding the characterization of specific biochemical signatures associated with each particular cancer patient or group of patients. Metabolomics approaches promise a better understanding of cancer, a disease characterized by significant alterations in bioenergetic metabolism, by identifying changes in the pattern of metabolite expression in addition to changes in the concentration of individual metabolites as well as alterations in biochemical pathways. These approaches hold the potential of identifying novel biomarkers with different clinical applications, including the development of more specific diagnostic methods based on the characterization of metabolic subtypes, the monitoring of currently used cancer therapeutics to evaluate the response and the prognostic outcome with a given therapy, and the evaluation of the mechanisms involved in disease relapse and drug resistance. This review discusses metabolomics applications in different oncological processes underlining the potential of this omics approach to further advance the implementation of precision medicine in the oncology area. Keywords: Precision medicine, Metabolomics, Oncology, Biomarker, NMR, PLS-DA. Keywords:Precision medicine, Metabolomics, Oncology, Biomarker, NMR, PLS-DA. Abstract:Nowadays, cancer therapy remains limited by the conventional one-size-fits-all approach. In this context, treatment decisions are based on the clinical stage of disease but fail to ascertain the individual ´s underlying biology and its role in driving malignancy. The identification of better therapies for cancer treatment is thus limited by the lack of sufficient data regarding the characterization of specific biochemical signatures associated with each particular cancer patient or group of patients. Metabolomics approaches promise a better understanding of cancer, a disease characterized by significant alterations in bioenergetic metabolism, by identifying changes in the pattern of metabolite expression in addition to changes in the concentration of individual metabolites as well as alterations in biochemical pathways. 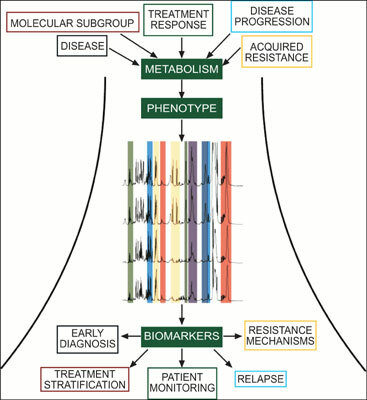 These approaches hold the potential of identifying novel biomarkers with different clinical applications, including the development of more specific diagnostic methods based on the characterization of metabolic subtypes, the monitoring of currently used cancer therapeutics to evaluate the response and the prognostic outcome with a given therapy, and the evaluation of the mechanisms involved in disease relapse and drug resistance. This review discusses metabolomics applications in different oncological processes underlining the potential of this omics approach to further advance the implementation of precision medicine in the oncology area.